First new English translation for 40 years. Includes illustrations by Jean-Louis Forain and Jean-François Raffaëlli. Translated with an introduction and notes by Brendan King. For details of how to purchase this book click here. First published in 1880, same year as Edgar Degas’ The Dancing Lesson and Edouard Manet’s solo show of brasserie paintings at La Vie Moderne gallery, J.-K. Huysmans’ Parisian Sketches shares with these vibrant Impressionist works a fascination with the contemporary life of Paris, an exuberant Paris in the era of the Opéra Garnier and the Folies-Bergères. Like the striking images of the early Impressionists, whom Huysmans championed when it was unfashionable to do so, Parisian Sketches is an all-out assault on the visual senses. Composed of a series of intense, meticulously observed impressions — of café concerts and circus performers, of streetwalkers and hot-chestnut sellers, of run-down slums and forgotten quarters in the grimy, shiny ’City of Light’ — Parisian Sketches recreates the Paris of the bal masqué and the can-can, the brasseries à femme and the buveurs d’absinthe, all captured with an imtimacy and an immediacy that confirms Huysmans as one of the masters of 19th century French prose. "No one, not even Toulouse-Lautrec, was so tireless a tracker of Paris’s genius loci as Huysmans. Like many of his radical contemporaries, he was obsessed by the idea of beauty within the ugliness of back-street Paris, by the thought that the distortions of depravity presented a truer picture of our spiritual nature than conventional religion or revolutionary excess. The excellent introduction to these cameos show how Huysmans saw his art as complementary to the painter’s. ’A Nightmare’ is genuinely chilling and oddly exultant. A tale about the wandering Jew is a mini-masterpiece. In this and other pieces, Huysmans begins and ends his tale with the same description — giving the whole the air of a medieval chant." "This wonderful collection of short stories is translated by Brendan King, who also provides an informative and helpful introduction. This text includes reproductions of Rafaelli and Forain’s original illustrations, as well as charcoal drawings by Odilon Redon. 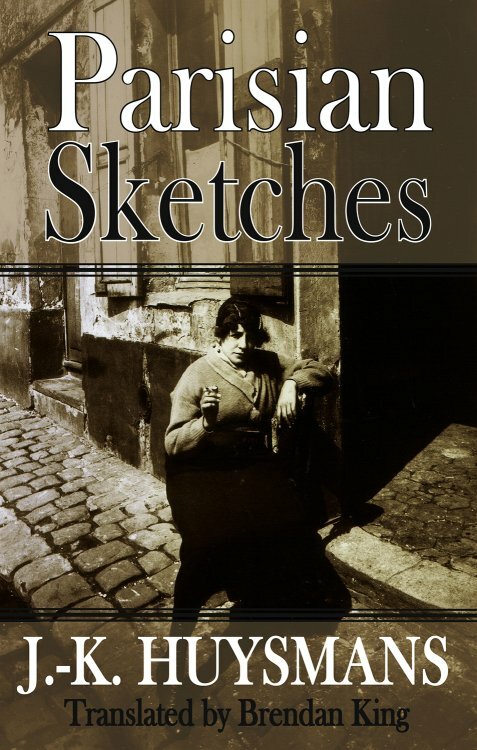 Parisian Sketches takes the reader back to the Paris of the late 1800s, when the urban landscape was rapidly changing in the grips of inexorable modernisation. Huysmans is our guide through the streets,back alleys and sordid nightspots which bristle with the energy of the day. Parisian Sketches, reissued in an excellent new translation, the first for over forty years, is Huysmans’ attempt to "do with pen what great artists have done with brush". Huysmans was one of the first to write about his artistic contemporaries, painters such as Degas, Whistler and Renoir, whose work often represented topics Huysmans used in his own novels.